The end of the financial year is near and here in Australia that means tax time is not far behind. It is usually come June or July when everyone is in a mad rush to get everything sorted and together in time to lodge their tax return. Even more so if you are a business over and perhaps haven’t been keeping the best records throughout the year. Oops. So what better time than now to look at how to organise tax records, whether your situation be simple and straight forward or more complex. And with these processes, you should be able to keep yourself organised for future years too so you aren’t doing the max rush tax return dash in the years to follow. Sound good? First things first – take a look at your record keeping system. 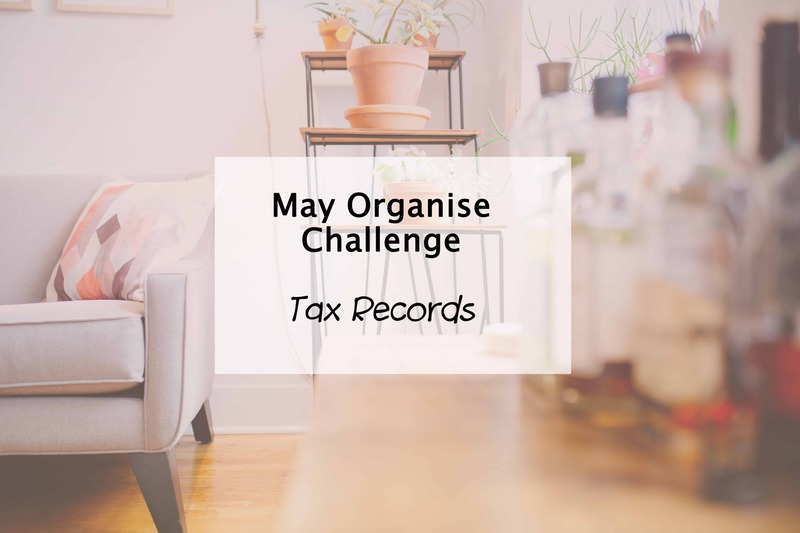 Personally I have never needed a complex system prior to this year, but having become a sole trader for both my professional work as a psychologist and for my freelance and blogging work has lead me to learn how to organise tax records quick smart! Pop over here and grab my basic tax record spreadsheet freebie to get you started if you like. Nothing fancy but good for basic tax record keeping. For others, particularly if your situation is more complex, you may require proper home accounting software to keep your finances in order. Alternatively, you may utilise the services of a book keeper or an accountant year round to do this stuff for you, providing them with the required documentation and information to take the stress out of tax time for you. Record keeping is still a must regardless. This means for your physical records and documentation, having an organised system is essential. This may mean hanging files in a filing cabinet, a tray system or another filing system that suits your needs. For some, a paperless system is preferred so you may instead wish to scan all your tax documents, however it would pay to check with your local tax department that this is suitable, as some tax records need to be retained for several years. With electronic records, always make sure you back them up. You never know when your computer may crash, so a great option I like to use is a cloud service such as DropBox or OneDrive. The bonus is being able to access all your records from any computer with an internet connection. Very useful! Report everything – even Martha Stewart found out the hard way of what happens if you don’t! Join the Simplify My Life challenge – not too late to give your life a complete overhaul with decluttering, organising and simplifying. Do you have any great tips on how to organise tax records?